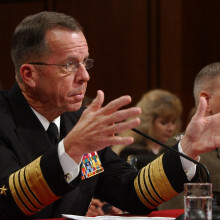 On Wednesday, military veterans and retired special operations officers demanded, in an open letter released by OPSEC, that former Joint Chiefs of Staff Chairman Admiral Mike Mullen be deposed by Congress. The reason they are making the demand is to find out why U.S. forces were not ordered to rescue the four American men who were under attack and died in Benghazi, Libya on September 11, 2012. Mullen and former Ambassador Thomas Pickering, who gave a lengthy, closed-door deposition on Tuesday, were responsible for issuing the State Department’s Accountability Review Board (ARB) report. Rep. Jason Chaffetz (R-UT) was disappointed that it took a subpoena to get Pickering before Congress and said there were still a lot more questions that needed to be answered and pointed to the State Department’s stonewalling on providing documents that have been requested. With that in mind the veterans at OPSEC believe that Mullen could bring to light critical information that has not yet come to light. “Deposing Ambassador Pickering about the serious gaps in the ARB report is a start but it’s actually his co-chairman, Admiral Mike Mullen, who has some of the most important questions to answer,” the veterans wrote in an open letter released by OPSEC. “Until the Committee hears about the unacceptable gaps in the report’s treatment of military response decisions around Benghazi we won’t begin to get a true understanding of what actually happened,” they added. “Your report states that you found “no evidence of…denial of support from Washington or the combatant commands.” That finding is in direct conflict with sworn testimony by DCM Hicks that a Special Operations team was denied permission to fly to Benghazi to assist in the response to the attack. Why did your report fail to account for that incident?